More questions than answers emerge from private meeting between politicians & top judge. A PRIVATE MEETING between Scotland’s top judge Lord President Lord Brian Gill and two MSP members of the Scottish Parliament’s Public Petitions Committee over a PUBLIC PETITION calling for judges to declare their full interests in court has raised serious questions over how far the judiciary are willing to go to avoid declaring secret wealth, hitherto unrevealed business links & family connections within the legal sector, allegations of offshore interests and even criminal convictions for benefits cheating. The unprecedented private meeting between Lord Gill, Convener David Stewart and Deputy Convener Chic Brodie MSP and the Clerk to the PPC in attendance, became the subject of heated debate at this week’s Petitions Committee meeting on Tuesday. The private meeting with the Lord President, held away from deliberations of the full Petitions Committee, came as a compromise solution because Lord Gill refused several invitations to appear before the Petitions Committee during 2013 to face questions on, and account for his vociferous opposition to a call for transparency over how judges recuse themselves in court and how judicial interests are not being properly declared. During the meeting, an account was given by the Convener & Deputy Convener of what had been said at the private meeting with Lord Gill. 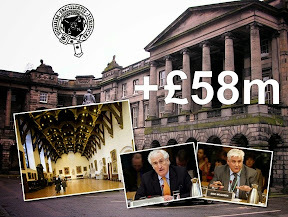 However, no written notes of the meeting had been handed to members of the Committee in advance of Tuesday’s Public Petitions Committee meeting, which caused some members to raise questions of the whole issue of Lord Gill refusing to appear before the Scottish Parliament on this issue. Raising the issue of minutes of the private meeting with Lord Gill, John Wilson MSP asked the Convener if any notes of what was discussed at the private meeting were going to be placed on the official record of the Committee. Jackson Carlaw MSP also pointed out that had it not been for tenacity of this committee so far, there would be no letter forthcoming from the Lord President. 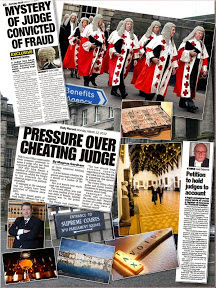 The day before the Public Petitions Committee met, it was reported on Diary of Injustice that limited declarations of interest by Scotland’s top judge and only six other members of Scotland’s vast, sprawling ranks of a multi million pound well salaried & well pensioned judiciary were published in the 2012-2013 Annual Report of the Scottish Court Service, a fact which Lord Gill omitted to tell MSPs in three ‘stonewalling’ letters of protest against the petition which the Lord President sent to msps last year. However, during Tuesday’s meeting earlier this week, an account given by the Deputy Convener to Committee members appeared to suggest the declarations by Lord Gill had come as a revelation from the Lord President himself during the private meeting which occurred only two weeks ago, leading some to feel Lord Gill is choosing a divide and conquer approach to how he responds to questions asked in private meetings, compared to questions raised by the Petitions Committee in published letters. 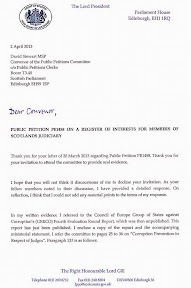 It was also reported to the Committee that Lord Gill had told both MSPs during the private meeting he would tinker with his apparently complicated computer systems to ensure data on judicial recusals was easier to come by for members of the public, albeit missing the point about publishing details of declarations of interest – called for by the petition itself. The limited declarations, required for the positions on the Scottish Court Service Board, appear to fly in the face of a series of excuses, complaints, accusations and veiled threats made by the Lord President in writing against the idea of creating a publicly available register of judicial interests, and raise questions over how Lord Gill has handed the judiciary’s battle against what is a simple call for transparency, itself supported by the Judicial Complaints Reviewer (JCR). Any publicly available register of judicial interests which could be created from the aims of the petition, would take in the entire judiciary and have to show criminal convictions,professional & other relationships, undeclared earnings and business links to law firms, investments, property and memberships of organisations and other information which commonly appears on registers of interest throughout the public sector. It has also come to light some of Scotland’s judges have not declared their interests or recused themselves in court in cases where persons have been wrongfully convicted of a criminal offence. Victims of miscarriage of injustice have then have gone on to suffer even greater injustice when it was revealed the same judges who prosecuted them while serving as Prosecutors for the Crown Office, had then gone on to hear the wrongfully convicted person’s appeal without recusing themselves from hearing the case, and had then dismissed the appeal. 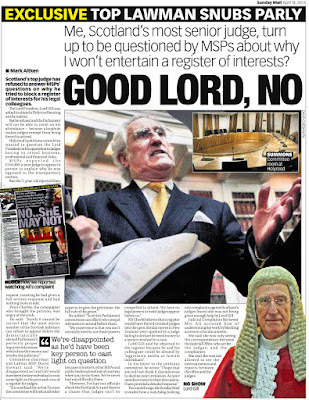 Lord Gill omitted to tell MSPs he declares some interests with ease. 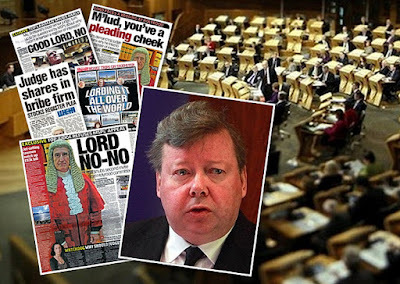 REFUSING at least two invitations to appear before a Scottish Parliament Committee, using deficiencies in the Scotland Act to avoid facing MSPs questions on a PUBLIC PETITION, and then going on to brand the media, litigants, court users & members of the public as “aggressive” & “hostile” in an attempt to thwart calls for judges to declare their interests, it can now be revealed Scotland’s top judge Lord President Lord Brian Gill has omitted to tell MSPs he IS actually required to declare at least some interests as the head of the board which controls Scotland’s courts. 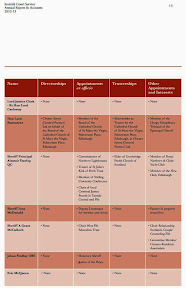 The declarations of interest by Scotland’s top judge and only six other members of Scotland’s vast, sprawling ranks of a multi million pound well salaried & well pensioned judiciary, feature in the 2012-2013 Annual Report of the Scottish Court Service, a fact which Lord Gill has strangely omitted to tell MSPs in three ‘stonewalling’ letters the Lord President sent to the Scottish Parliament. 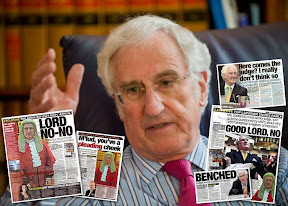 And, contrary to the written claims of Lord Gill that it would be unworkable for the judiciary to declare their interests, and that the very notion of having judges declare their interests may breach judges privacy, cause them undue suffering and bring the courts to a complete standstill, the seven members of the judiciary who sit on the all powerful board of the Scottish Court Service, seem not to have suffered at all by interests they have wished to declare in keeping with their positions on the SCS board. 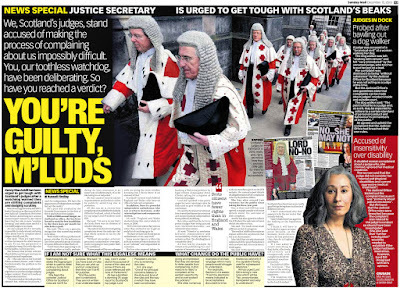 A further six people ranging from the Chief Executive of the Scottish Court Service to lawyers and others also sit on the SCS Board, apparently declaring their own interests with ease and none of the fuss which Scotland’s top judge insisted would bring the justice system to a stand still. 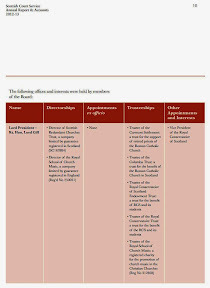 The declarations, required for the positions on the Scottish Court Service Board, appear to fly in the face of a series of excuses, complaints, accusations and veiled threats made by the Lord President in writing against the idea of creating a publicly available register of judicial interests, and raise questions over how Lord Gill has handed the judiciary’s battle against what is a simple call for transparency, itself supported by the Judicial Complaints Reviewer. 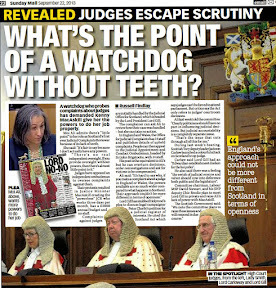 It also came to light some of Scotland’s judges have not declared their interests or recused themselves in court, contrary to claims made by the Lord President, and that persons wrongfully convicted have suffered even greater injustice when it was revealed that judges who once prosecuted them, had heard their appeals against wrongful convictions and kept quiet. 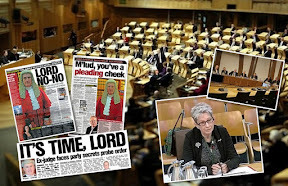 So far, Lord Gill has failed to appear before the Public Petitions Committee of the Scottish Parliament to explain his deep seated opposition to the transparency issue of declarations made by members of the judiciary in court or answer questions from MSPs on the proposal to create a register of judicial interests. Petition PE1458: Register of Interests for members of Scotland's judiciary is due to be heard again at the Scottish Parliament tomorrow, Tuesday 28th January 2014 and will include a report or comment on a private meeting held last Tuesday between the Convener and Deputy Convener of the Public Petitions Committee and Scotland’s top judge Lord Brian Gill. 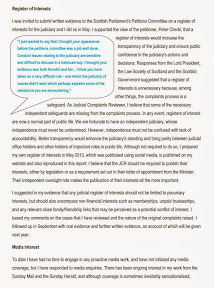 Moi Ali, Scotland’s First Judicial Complaints Reviewer to stand down over lack of support from Scottish Government. SCOTLAND’S Judicial Complaints Reviewer (JCR) is to stand down from the post created by legislation in 2008 which was intended to investigate and review how judges investigate complaints against themselves. 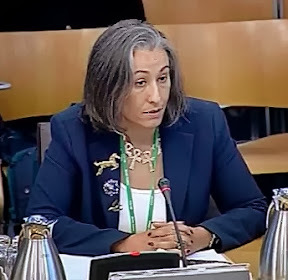 It has been revealed that Moi Ali, the first person to hold the office of Judicial Complaints Reviewer has told Scotland’s Justice Secretary Kenny MacAskill that she will not seek a second term in the role because she has complained the post is mere “window dressing” and “tokenism”. Moi Ali, who took on the post of JCR after it was created in 2008 has endured a difficult term due to a lack of cooperation from the judicial office who refused to share documents and details relating to complaints made by members of the public against judges. In particular, Moi Ali encountered difficulties in dealing with Scotland’s top judge, Lord President Lord Brian Gill, who it was revealed, had dismissed earlier findings against fellow judges, and had gone on to brand the office of Judicial Complaints Reviewer as “a third party” when it came to handing over details on complaints made against judicial colleagues and discussions on how those complaints had been investigated by other judges. 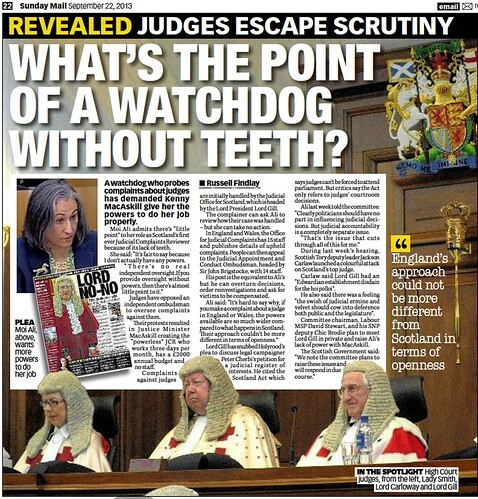 MacAskill created a watchdog without teeth on orders of angry judges with undeclared secrets. The position of Judicial Complaints Reviewer was created by an Act of the Scottish Parliament in 2008, principally highlighted in Section 30, S31 and S32 of the Judiciary and Courts (Scotland) Act 2008. However, protests from vested interests within Scotland’s judiciary and legal profession from Scotland’s judges who were “dead against” proposals to create an independent form of regulation of judges resulted in what legal observers have branded “a cowardly capitulation” by Justice Minister MacAskill. 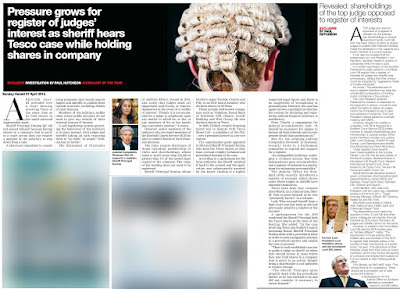 The lobbying from Scotland’s unaccountable judges and their allies in the justice system led to the creation of a Judicial Complaints Reviewer without any statutory powers, working on a three days a month basis and with an annual budget of £2000 and no staff. 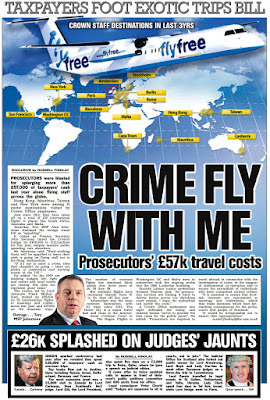 In England and Wales, the situation is very different from Scotland, where the Office for Judicial Complaints has 15 staff and publishes details of upheld complaints. If complainants remain dissatisfied with how their case was handled, they can appeal to the Judicial Appointment and Conduct Ombudsman, headed by Sir John Brigstocke, with 14 staff. 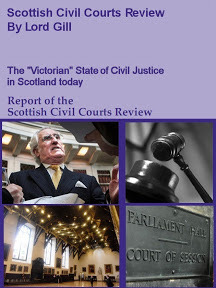 And, although Scotland’s Judicial Complaints Reviewer has been given no statutory powers to deal with complaints against judges, the Judicial Appointment and Conduct Ombudsman in England has statutory powers enshrined in law, and can overturn decisions, order reinvestigations and ask for victims to be compensated. 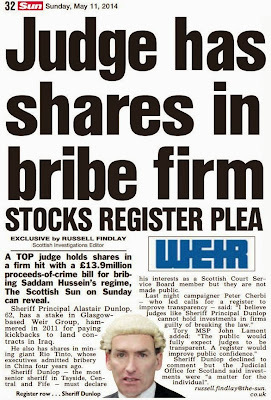 First Annual Report of JCR for 2011-2012 revealed Scotland’s top judge froze out independent Judicial Investigator. 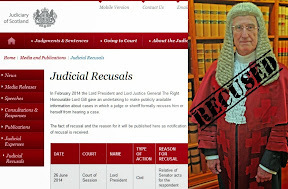 To illustrate what has become a consistent lack of cooperate from the judicial office, the first annual report from Moi Ali last year reiterated concerns over refusals by judges to share information with investigators, previously reported in February by the Sunday Mail newspaper and featured on Diary of Injustice here: Annual Report revealed Lord President Lord Gill ‘froze out’ Judicial Complaints Reviewer amid series of revoked findings, secret unshared memos & dismissed complaints. 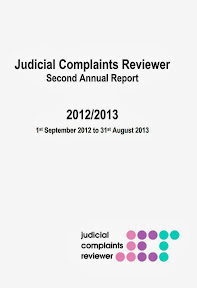 Ms Ali’s first annual report, which can be read online here : Judicial Complaints Reviewer Annual report 20011- 2012 or available via the JCR’s website HERE reveals a series of incidents where her office has been blocked by the Lord President from accessing communications, internal memos and reports between the office and the judges about complaints. Second annual report - JCR lacks much needed powers. The Judicial Complaints Reviewer’s 2012-2013 annual report revealed continuing issues of concern and further instances where the Judicial Office has refused to share files and paperwork in relation to complaints made against judges and how were handled. The report also makes reference to incidents such as where Scotland’s top judge Lord Brian Gill refused to hand over information to the JCR. Gill claimed Moi Ali’s office was a "Third Party" and that data cannot be shared with her office for reasons of confidentiality. However, the confidentiality concerns of Gill appear to be restricted to Scotland, as the same information in England & Wales is published online. It also emerged in the JCR’s second annual report that even though a Memorandum of Understanding was signed between the JCR & Judicial Office earlier this year on respective roles, responsibilities and agreed undertakings, the situation regarding the contents of files has not been resolved to Ms Ali’s satisfaction. 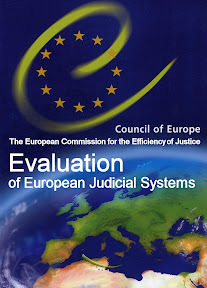 JCR 2012-2013 Annual Report confirms support for a Register of Judicial Interests, recommends extending interests to be declared. 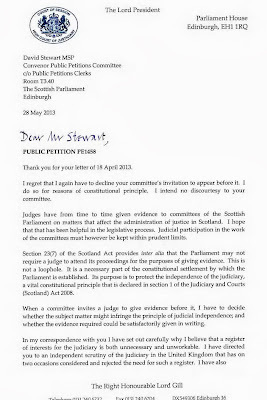 Register of Interests : I was invited to submit written evidence to the Scottish Parliament’s Petitions Committee on a register of interests for the judiciary and I did so in May. I supported the view of the petitioner, Peter Cherbi, that a register of interests would increase the transparency of the judiciary and ensure public confidence in the judiciary’s actions and decisions. Responses from the Lord President, the Law Society of Scotland and the Scottish Government suggested that a register of interests is unnecessary because, among other things, the complaints process is a safeguard. As Judicial Complaints Reviewer, I believe that some of the necessary independent safeguards are missing from the complaints process. In any event, registers of interest are now a normal part of public life. We are fortunate to have an independent judiciary, whose independence must never be undermined. However, independence must not be confused with lack of accountability. Better transparency would enhance the judiciary’s standing and bring parity between judicial office holders and other holders of important roles in public life. Although not required to do so, I prepared my own register of interests in May 2013, which was publicised using social media, is published on my website and also reproduced in this report. I believe that the JCR should be required to publish their interests, either by legislation or as a requirement set out in their letter of appointment from the Minister. Their independent oversight role makes the publication of their interests all the more important. I suggested in my evidence that any judicial register of interests should not be limited to pecuniary interests, but should also encompass non-financial interests such as memberships, unpaid trusteeships, and any relevant close family/friendship links that may be perceived as a potential conflict of interest. I based my comments on the cases that I have reviewed and the nature of the original complaints raised. I followed up in September with oral evidence and further written evidence, an account of which will be given next year. 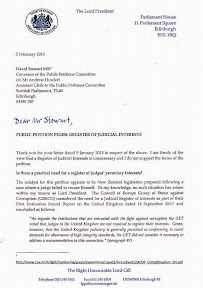 Petition PE1458: Register of Interests for members of Scotland's judiciary is due to be heard again at the Scottish Parliament on Tuesday 28th January 2014 and will include a report or comment on a private meeting held last Tuesday between the Convener and Deputy Convener of the Public Petitions Committee and Scotland’s top judge Lord Brian Gill. Unprotected: Scots consumers have no protection from dodgy solicitors who regulate themselves. 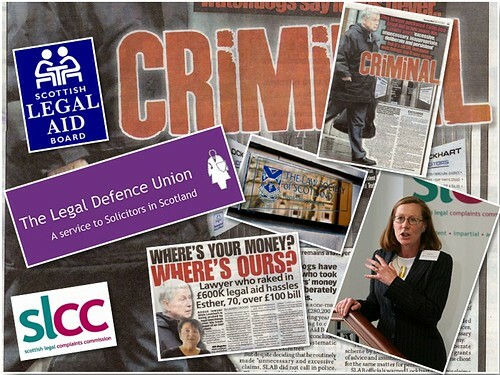 UNTIL the dual role of representing both clients and solicitors is removed from the Law Society of Scotland, and clients of Scotland’s closed shop legal profession are given the same or even greater standards of consumer protection & independent regulation as currently operate in England & Wales, there is little incentive for Scottish solicitors to behave anything other than badly, as BBC Scotland found recently in their investigation of Lawyers Behaving Badly. 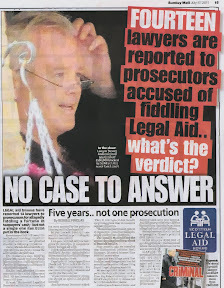 More often than not, the fact is, those of us who require to use legal services in one way or another via a lawyer, or those of us who require access to the courts in Scotland are taken on the same, well trodden, fee-generating-years-long ride by solicitors & law firms who have no reason to offer high quality, low cost access to justice in a legal system which is closed shop, monopolistic, and poorly regulated. 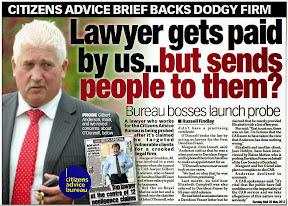 Just as fee paying clients are routinely ripped off, so is the taxpayer by way of a £150 million pound legal aid budget which seems to exist as little more than a public subsidy to prop up dodgy law firms & lawyers who would serve the community better from a position behind bars, sitting in a High Street office raking in tens of thousands of pounds a year from the public purse. 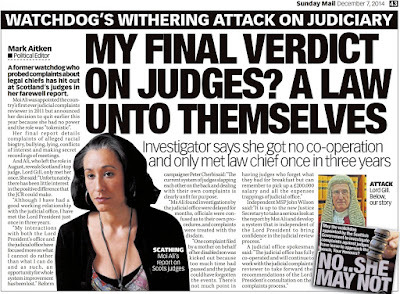 This is of course, not news to anyone who has been let down by a solicitor, and it is certainly not news to members of the public who have experienced the almost inhuman mix of regulatory bodies in Scotland, the Scottish Legal Complaints Commission (SLCC), the Law Society of Scotland and the Scottish Solicitors Discipline Tribunal, who currently hold court over all complaints against Scottish solicitors. 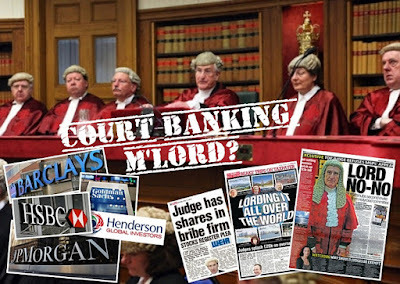 Neither has the SLCC cleaned up standards in the legal profession, nor has it named and shamed any crooked lawyers, nor has it protected clients any better than the Law Society of Scotland, who are equally as fixated as the SLCC on attending to, and apparently representing the interests of its membership the legal profession and much the same, found BBC Scotland in their recent Lawyers Behaving Badly investigation of Scotland’s out of control legal profession. As the Lawyers Behaving Badly programme has now finished its term on the BBC’s iPlayer and clips of what was broadcast have been removed from the internet by the BBC, apparently after alleged protests from the legal profession and the Law Society of Scotland, those with an interest in how the Scottish legal profession regulates itself in Scotland still have access to articles on this site. A solicitor who ruined pensioner's legal affairs was given slap on the wrist by law complaints regulator SLCC. KILMARNOCK solicitor Niels S Lockhart, who was accused by the Scottish Legal Aid Board (SLAB) of making £670K worth of dodgy claims for legal aid work and who then went on to ruin the legal affairs of a pensioner and other clients was allowed to continue working as a lawyer after the Scottish Legal Complaints Commission (SLCC), the ‘independent’ regulator of solicitors decided his firm NS Lockhart Solicitors need only pay a meagre fine of ONE HUNDRED POUNDS to a victim who had complained about the legal nightmare she had been put through. Diary of Injustice also published the investigation carried out by the Scottish Legal Complaints Commission into Niels S Lockhart. The report can be viewed online here : SLCC Investigation of complaint against Niels S Lockhart of NS Lockhart Solicitors, Kilmarnock. 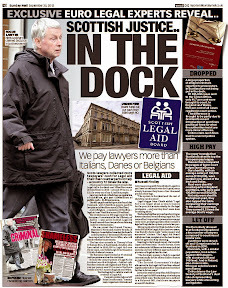 Crown Office also refused to prosecute dodgy legal aid lawyers. An exclusive report in the Sunday Mail newspaper also raised questions about the Crown Office lack of will to prosecute lawyers who were accused of legal aid fraud, revealing that FOURTEEN lawyers accused of multi-million pound legal aid fraud escaped justice as Scotland’s Crown Office fail to prosecute all cases in 5 years. Legal aid bosses reported 14 lawyers to prosecutors for allegedly fiddling a fortune in taxpayers' cash - but not a single one has been put in the dock. Eleven suspected fraud cases were marked no proceedings, one lawyer was declared insane, one died and the other is still being considered. Crown officials did not identify any of the lawyers involved or reveal the scale of their alleged fraud. The revelations were made by Crown Office and Procurator Fiscal Service director of operations Scott Pattison in response to a freedom of information request. Non appearance of top Law Society regulation boss in BBC investigation questioned QUESTIONS have been raised as to why Philip Yelland, the little known figure in charge of regulation of Scotland’s solicitors for the past two decades was not allowed to appear on Lawyers Behaving Badly, the recent BBC Scotland investigation on systemic failings in how the Scottish legal profession regulates itself and how lawyers have regularly escaped justice and continue to benefit from publicly funded legal aid. In response to media enquiries, sources at the Edinburgh HQ of the Law Society of Scotland have confirmed that repeated requests from BBC Scotland for access to the society’s Director of Regulation were refused by Law Society chiefs who were determined there should be no access to, or any appearance by the twenty plus year serving head of regulation in the BBC programme. Substituting for the Director of Regulation, the Convener of the Law Society’s Regulation Committee, Carole Ford was instead, interviewed on the powerful BBC programme broadcast last week. However, while Ford’s performance was expectedly praised in some legal quarters, some legal experts, clients, and those who have experienced the ‘alice in wonderland’ world of how the legal profession regulates itself felt the Committee Convener was a poor substitute, and appeared to have little grasp as to the realities of how the system works, and how paying clients are treated by lawyers who regularly cover up for their own colleagues. While many expected Mr Yelland to be part of the BBC investigation, there are numerous reasons as to why the one person in legal regulation circles who has been involved in many of the controversial and highly public cases involving solicitors escaping penalty for their actions over the past twenty years did not appear on the highly acclaimed undercover investigation by BBC journalist Sam Poling. 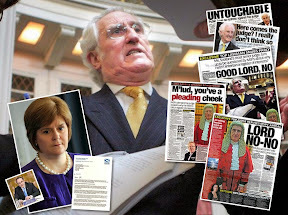 The Law Society’s reluctance to allow Mr Yelland’s appearance in the BBC programme may well stem from the unfortunate demise of the Society’s former Chief Executive Douglas Mill, who resigned a few weeks after the Law Society’s Council viewed and debated video footage posted to video sharing website You Tube of Mill’s angry confrontation at a Holyrood Justice Committee hearing with John Swinney, Scotland’s Finance Chief. 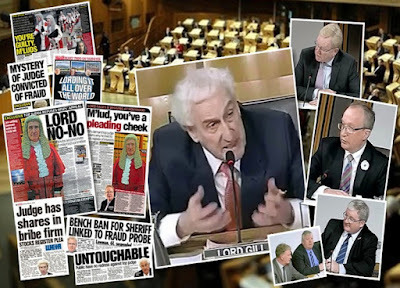 During the Justice Committee hearing in 2006 which formed part of the Scottish Parliament’s second, ill-fated attempt to clean up regulation of the legal profession, the former Chief Executive was caught out by the Scottish Parliament’s video coverage of the hearing when he argued with the SNP Finance Chief that the Law Society’s Master Policy, the insurance scheme which protects corrupt lawyers from clients, was fair, and that there was no collusion between figures at the Law Society and the insurers to throw out financial damages claims made by clients. 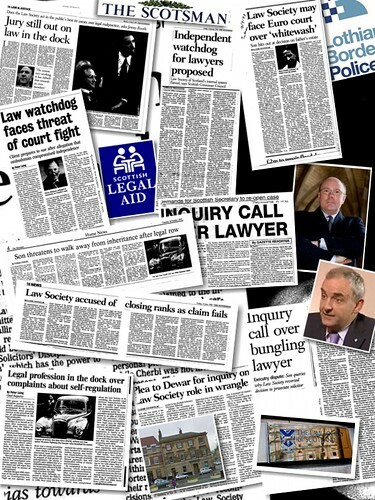 However, Mr Swinney, a skilled debater himself, trounced the then pugnacious Law Society Chief on all points, leaving the public with little doubt the Master Policy Insurance client compensation scheme run by the Law Society of Scotland is unfair and claims made by clients for damages are clearly subject to concerted and determined manipulation at the highest levels of the Law Society and the legal profession. The footage featuring Mill's Holyrood confrontation with John Swinney was first posted to the You Tube video sharing website in late December 2007. Mill, who superseded the equally controversial Kenneth Pritchard as Secretary of the Law Society of Scotland in the early 1990’s, then going on to become the Society’s Chief Executive and expected by many to remain in the position for a lengthy period of time, resigned a few weeks later in January 2008. 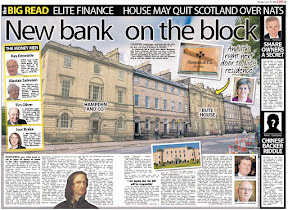 The confrontation between the former Law Society Boss and Scotland’s now Finance Chief, has since become a warning to how Law Society figures used to a closed world lacking any accountability can quickly stumble in public appearances such as the Holyrood Master Policy clash which made it obvious to all that the Law Society was, and remains determined to hang onto self regulation and the power that comes with it, at any cost. Fears of BBC questions over claims made by clients against solicitors may also have played a part in the Society’s refusal to allow access to its regulation chief. 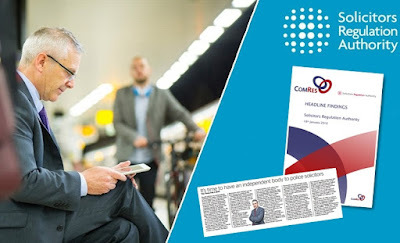 Academics heard involvement of Regulation Boss was linked to controversial complaints. 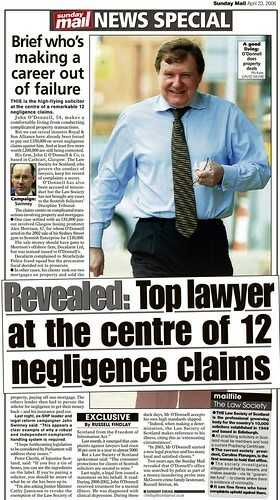 A case referred to in a Research Report from the University of Manchester School of Law documented allegations in papers which have never been made public that the Society’s long time Regulation Chief was also allegedly linked to a case of a claim involving the Master Policy, where a respected businessman & family man from Oban committed suicide after he was sent to a law firm who have since been identified in a number of cases where dodgy solicitors have escaped justice and even possible criminal charges for legal aid fraud. 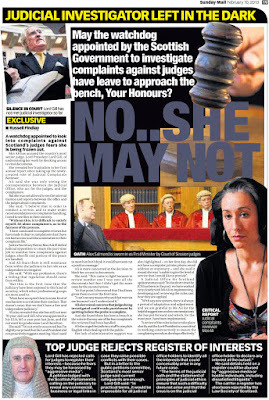 The revelations, appearing in papers studied by Professor Frank Stephen & Dr Angela Melville of the Manchester University of Law School in 2009 who were compiling a report on the Master Policy for the Scottish Legal Complaints Commission (SLCC), alleged the businessman from Oban had been sent to a Glasgow law firm to represent him in a court case against his former solicitors. However the Glasgow based law firm, who have since represented the First Minister himself and a number of controversial figures in the legal world, did nothing for a period of three years and when it was revealed the same law firm who the Law Society’s Regulation Chief had allegedly recommended to the Oban businessman were also representing the Legal Defence Union, the organisation which represents crooked lawyers against complaints, the unnamed client committed suicide. 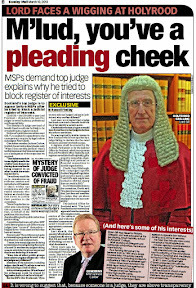 Against a background of too-numerous-to-mention cases where involvement of the twenty year plus serving Law Society’s Regulation Boss appears to have played a key part in allowing corrupt solicitors to remain in work, Yelland may well have faced difficult questions over his involvement in one of the key parts of the BBC Scotland report aired last week, that of former solicitor Tom Murray, currently living in Lucca, Italy. Featured in the Lawyers Behaving Badly documentary, Murray, has appeared before the Scottish Solicitors Discipline Tribunal (SSDT) on no less than three occasions, (i) Law Society-v-Thomas Hugh Murray 01/03/2005 (ii) Law Society-v-Thomas Hugh Murray 25/11/2005 and (iii) Law Society-v-Thomas Hugh Murray 10/12/2009. 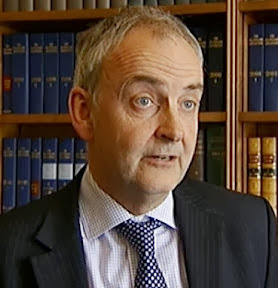 Former solicitor Murray, who said on the BBC programme during secret filming that if he returned to Scotland he could reapply to be a solicitor again, was found guilty of professional misconduct in respect of misrepresentation, deception and misleading clients including his failure to tell his clients he had been barred from practising as a lawyer. The solicitor who was sequestrated in Scotland in 2001 and continues to avoid any moves by the Law Society to take action against him and recover compensation awarded to his clients. 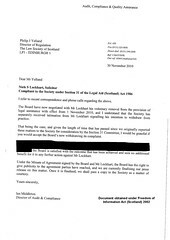 In a long, rambling statement attacking the BBC Scotland programme, the Law Society of Scotland made no mention as to why Mr Yelland refused to appear, nor did the Society explain why the one man who can be linked to many of the complaints made against Scottish solicitors which have done significant damage to the image of the profession, did not appear or give an account of his charge over regulation of, and standards in Scotland’s legal profession in the past two decades. Regulators behaving typically – SLCC statement on BBC investigation into dodgy solicitors. AMID widespread criticism from the legal profession over the content of a popular and well researched BBC Scotland investigation Lawyers Behaving Badly, which revealed significant failures in self regulation of the legal profession, the much criticised and often pro-lawyer Scottish Legal Complaints Commission (SLCC) has issued a statement welcoming the BBC programme “for raising some important issues” on how complaints against solicitors are currently dealt with by the ‘independent’ regulator. 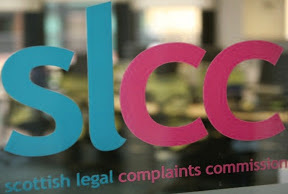 The SLCC, itself beset with complaints about how it mistreats clients & complainants and how it appears to operate on an anti-consumer platform, also claimed in a Press Release that it wished to work more closely with the Scottish Legal Aid Board (SLAB) and the Law Society of Scotland to ‘share information and intelligence with these organisations to help identify risks to the public’. Statement from the Scottish Legal Complaints Commission regarding BBC Scotland’s Lawyers Behaving Badly investigation: On Wednesday night, the BBC screened the latest BBC Scotland Investigates: “Lawyers Behaving Badly”. The programme investigated the regulation of the legal profession in Scotland and the role of the different organisations involved. We welcome the programme for raising some important issues. We know from our trends analysis that problems with solicitors often arise during important life events – buying and selling a house, divorce, wills. The public rightly expects high standards of conduct and service from their solicitors and it is a serious matter when these are not met. As the single gateway for all complaints against legal practitioners in Scotland, we provide the first point of contact in the legal complaints system. In the four years from 1 July 2009-30 June 2013, we dealt with 4929 complaints. Under the current system, it is our responsibility to investigate service issues. In the last year alone, we awarded £250,000 in compensation or rebated fees for inadequate service. We are upholding more complaints than ever while also offering complainers alternate means to get a resolution. We also aim to reduce the occurrence of service issues by researching and producing guidance for the profession to help them improve. Our powers regarding complaints about the conduct of solicitors raised with us are limited. If we decide the complaint has merit, we will pass it over to the Law Society of Scotland to investigate. We can investigate how it handles the complaint, but only if the complainer asks us to and the action we can then take is restricted. We also audit the Law Society’s overall complaints process. We have no oversight over the Scottish Solicitors Discipline Tribunal (SSDT). It is clear that we, the Law Society of Scotland, the Scottish Legal Aid Board and the SSDT could work together more closely. We are already sharing information and intelligence with these organisations to help identify risks to the public. We are committed to working with them to improve the effectiveness of the system and to continue to build public trust and confidence in Scotland’s legal system. 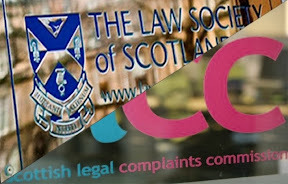 Commenting on the SLCC’s wish to work more closely with the Law Society & Scottish Legal Aid Board, a legal insider said the idea could only work if each of the three bodies had greater oversight over their operations and were able to gain public trust and confidence in their operation, combined with increased transparency. Earlier this week, it was reported a spokesperson for the Legal Aid Board who gave reaction to the BBC’s investigation of dodgy lawyers also said SLAB supported an idea from the Scottish Legal Complaints Commission that a regulator’s forum should be set up. Speaking to Diary of Injustice this afternoon, a client who encountered significant delays and difficulties with the Scottish Legal Complaints Commission said he felt like he “was talking to a bunch of lawyers” throughout the time he dealt with the SLCC. The client branded the SLCC as bad as the Law Society, calling the regulator “a lawyer set up to bury complaints against other lawyers”. The hapless regulator then took nearly a year to accept the complaint against the solicitor concerned, who went on to time waste, then use mediation as a further time wasting measure, upon the failure of which, the complaint re-entered the investigation stage and ended up with only a partially upheld finding. Speaking of his experiences with the SLCC, the client commented: “No matter what material is handed over to the SLCC and how often you have to make the points again and again that your solicitor has stolen money and property deeds, this regulator seems to allow crooked lawyers to go on working”. How lawyers regulate themselves is to blame for current mess says Legal Aid Board. AHEAD of a BBC Scotland investigation Lawyers Behaving Badly which reports on failings in how lawyers regulate themselves, to be broadcast later today at 10:35pm on BBC One Scotland, the Scottish Legal Aid Board (SLAB) has revealed it has long standing concerns that it can take too long for the Law Society of Scotland and the current mix of lawyer controlled regulators to investigate and make decisions in disciplinary cases involving solicitors. The spokesperson continued: “The legal aid system was set up to enable people who could not afford legal help to get access to it, rather than as a regulatory system for solicitors. While there were some regulatory aspects in the Legal Aid (Scotland)1986 Act, and further compliance aspects have been developed for areas like criminal registration, it is an on-going and developing process. “Following investigations by the Board we did just that when we de-registered the solicitor Iain Robertson and his firm Robertson and Ross. 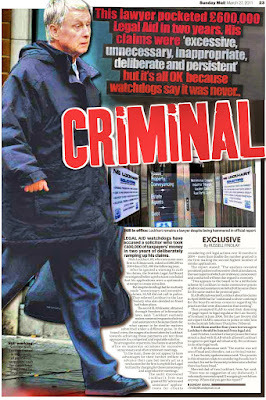 In 2010, both he and the firm were removed from the criminal register for failing to comply with our Code of Practice. 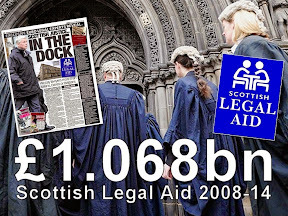 A sum of £221,847 was also repaid to the Legal Aid Fund. In response to today’s media coverage of the forthcoming BBC investigation, the Law Society of Scotland attempted to blame the Scottish Legal Aid Board for failings in dealing with problem lawyers who are still working with firms receiving large amounts of tax payer funded legal aid. Late this afternoon, a legal insider rubbished the Law Society’s attempt to blame the Legal Aid Board for failings in how the Society dealt with solicitors featured in the BBC programme. Diary of Injustice also published the investigation carried out by the Scottish Legal Complaints Commission into Niels S Lockhart. The report, now in the hands of media outlets, can be viewed online here : SLCC Investigation of complaint against Niels S Lockhart of NS Lockhart Solicitors, Kilmarnock. 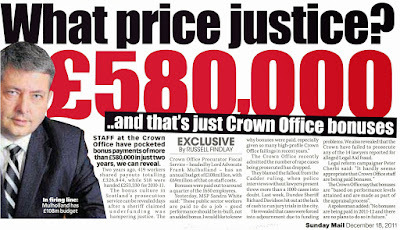 Crown Office also refused to prosecute dodgy legal aid lawyers. An exclusive report in the Sunday Mail newspaper also raised questions about the Crown Office lack of will to prosecute lawyers who were accused of legal aid fraud, revealing that FOURTEEN lawyers accused of multi-million pound legal aid fraud escaped justice as Scotland’s Crown Office fail to prosecute all cases in 5 years. Legal aid bosses reported 14 lawyers to prosecutors for allegedly fiddling a fortune in taxpayers' cash - but not a single one has been put in the dock. Eleven suspected fraud cases were marked no proceedings, one lawyer was declared insane, one died and the other is still being considered. Crown officials did not identify any of the lawyers involved or reveal the scale of their alleged fraud. 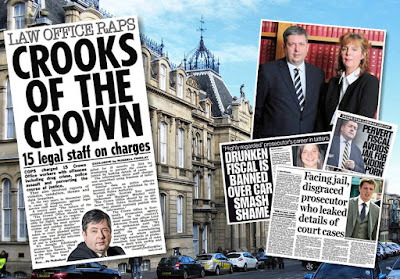 The revelations were made by Crown Office and Procurator Fiscal Service director of operations Scott Pattison in response to a freedom of information request. 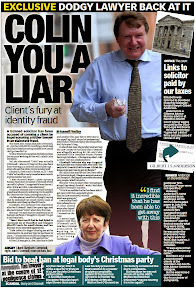 Decades of lawyers looking after each other has destroyed confidence in Scots legal profession. 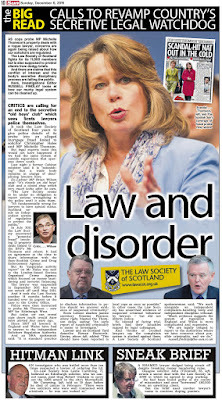 THE Law Society of Scotland should be stripped of its dual role of acting for lawyers and the public, says a leading legal academic who has publicly called for an end to the self regulation cartel of Scottish lawyers looking after each other. 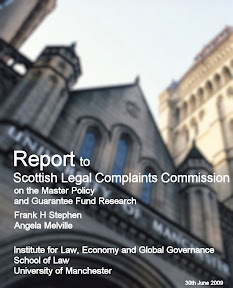 The call for change comes amid overwhelming evidence that Scots consumers & clients who fall victim to rogue lawyers rarely if ever secure a fair hearing for their complaints or receive correct recompense for significant financial losses or embezzlement by their solicitors, due to lawyers covering up for each other. 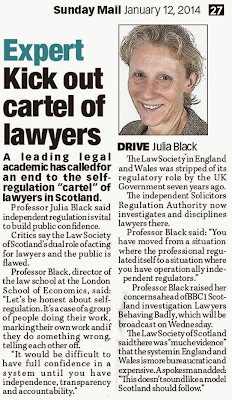 Speaking to the Sunday Mail newspaper ahead of a BBC Scotland investigation on how solicitors make a mockery of the current system of regulation of complaints against the legal profession, Professor Julia Black of the London School of Economics said independent regulation is vital to build public confidence. On Wednesday 15 January 2014 at 22:35, BBC Scotland will broadcast their investigation “Lawyers Behaving Badly”, where journalist Samantha Poling investigates a regulation system which clients say favours the profession rather than the consumer, and goes undercover to investigate solicitors making a mockery of the system. Those involved in the debate regarding self regulation of Scotland’s legal profession will be well aware of the ill fated attempts between 2001-2007 to create a more independent system of regulation, which saw the creation of the pro-lawyer, anti-client Scottish Legal Complaints Commission. Since the SLCC was created in 2008 by Justice Secretary Kenny MacAskill, there have been little if any improvements in how consumer complaints against Scottish solicitors are investigated. The current model of self-regulation of Scottish solicitors, where the SLCC investigate complaints against lawyers, appears to have led to record numbers of solicitors escaping sanction or prosecution for offences committed against clients. Critics of the current system and its in-built pro-lawyer bias point to the fact the SLCC itself is effectively run by the Law Society who pay for its running through subscriptions raised by lawyers who in turn increase client fees to fund their own pat-on-the-back self regulation cartel. The frequent, almost serial failures of the Scottish Legal Complaints Commission has been widely reported in previous articles. A leading legal academic has called for an end to the self regulation “cartel” of lawyers in Scotland. Professor Julia Black said independent regulation is vital to build public confidence. Critics say the Law Society of Scotland’s dual role of acting for lawyers and the public is flawed. Professor Black, director of the law school at the London School of Economics, said: “Let’s be honest about self-regulation. "It’s a case of a group of people doing their work, marking their own work and if they do something wrong, telling each other off. The Law Society in England and Wales was stripped of its regulatory role by the UK Government seven years ago. The independent Solicitors Regulation Authority now investigates and disciplines lawyers there. Professor Black raised her concerns ahead of BBC1 Scotland investigation Lawyers Behaving Badly, which will be broadcast on Wednesday. 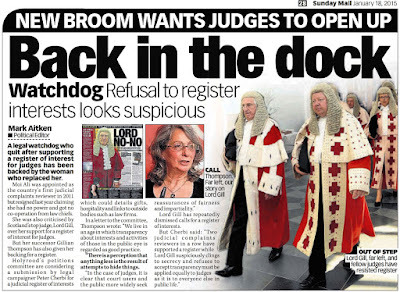 Last year,Scotland’s top judge opposed all debate on register of judicial interests. 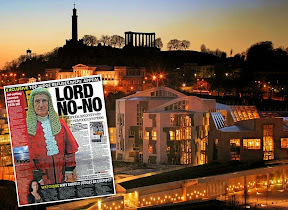 IN AN ATTEMPT to make a proposal currently being debated by MSPs to create a register of judicial interests sound more like a complicated scientific mission to land the first member of the judiciary on the moon, Scotland’s top judge, Lord President Lord Brian Gill incurred great effort in leaving little doubt in 2013 that he opposed any move by the Scottish Parliament to create, or even debate proposals to require judges by law to declare all their interests in a published register of interests. 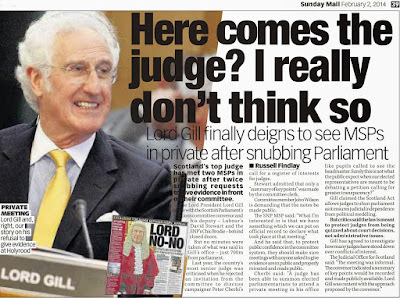 During the past year of debate on Petition 1458, Lord Gill and the judiciary had a task at hand. In their eyes, the subject of judicial interests could not be debated in public, for it would reveal the shambles of judicial oaths, the shambles of rules the judges wrote themselves, rich judges, judges with criminal records, judges with tax dodging investments , judges with multiple conflicting interests, and judges who once prosecuted people then threw out their appeals against wrongful convictions. Clearly if MSPs and the public delved deeper, the truth would be revealed, showing that recusals in court were in most cases, not taking place and most certainly not being recorded, should anyone ever ask to see the data. 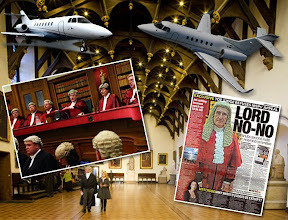 It was quite a surprise to some that the focus and public face of Scotland’s world travelling judiciary and its supporting vested interests should collapse so easily like a house of cards at such a simple proposal asking the Scottish Parliament to debate and ultimately legislate to ensure that the well earned, well kept, yet unusually secretive members of Scotland’s judiciary should set out their complete interests in a published register of interests like all other public servants are required to undertake. However, the lengths which the judiciary were to go to, in an effort to protect themselves against any required disclosure of, or even debate surrounding their interests, was nothing short of stunning arrogance against a simple call for transparency, an act which if anything has encouraged public debate and brought to the fore the lack of accountability in the judiciary. 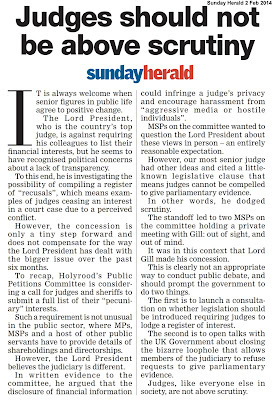 Not only was the Lord President opposed to giving evidence at the Scottish Parliament and replying to questions from MSPs on a proposal contained in Petition 1458 to create a register of judicial interests, Lord Gill refused several invitations to appear at Scotland’s elected Parliament to face questions from MSPs on his opposition to the transparency proposal. 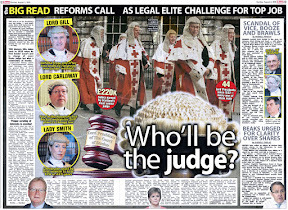 While refusing to give answers to many of the questions put to him on the numbers of cases in which Scottish judges have recused themselves and in what circumstances recusals have occurred, Lord Gill twice referred MSPs to quotes from an obscure EU report written by judges who effectively used the opportunity of compiling the EU quango report to lobby against any proposal to require members of the judiciary to declare their interests. As the debate at Holyrood unfolded, it was clear the Lord President was willing to oppose the call for a register of interests in writing, but not attend the Scottish Parliament in person to be questioned in public and on camera about his opposition to the transparency proposals of judges declaring their interests. 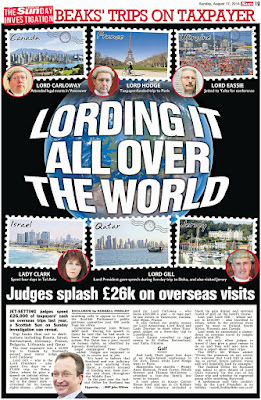 Not satisfied, Lord Gill overstepped the mark, accusing the media, litigants, court users, indeed anyone and everyone who may have cause to question a judge’s interests in a court case, of harassment and even hostility, just because the very transparency judges demand of everyone else in court may end up being used by the public to delve into the secrets of the judiciary’s undeclared private wealth, undeclared earnings, friendships and professional relationships, all of which may be relevant to countless cases in our courts. 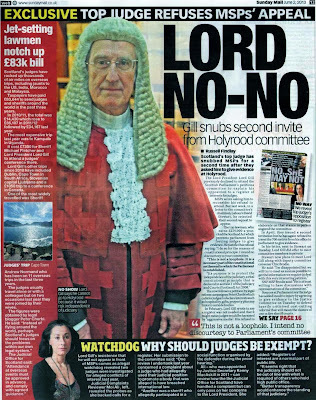 And to make sure the Lord President had his way in his attempts to hinder proper public debate on the question of judicial interests, Lord Gill threw passages of the Scotland Act itself in the face of MSPs, claiming a somewhat debatable interpretation of the Act which Lord Gill implied exempted him from being called to answer questions on the very interests judges are so eager to keep secret. 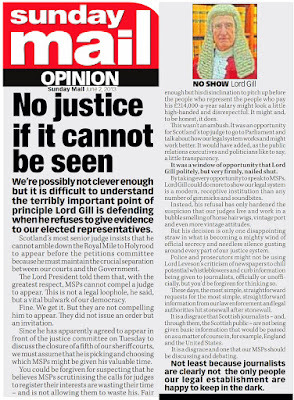 Desperate to fluster any debate on the subject, Lord Gill even implied the very independence of the judiciary itself was being challenged in the proposal put forward to require judges to declare their interests. Clearly, independence of the judiciary was not being challenged. The Lord President had again misapplied the term to stifle debate, as judges do when the tables of transparency are turned. 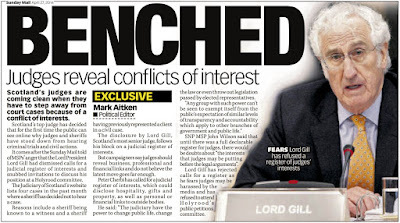 Lord Gill’s opposition to transparency of his and his colleagues interests was, and is absolute. There is to be no public debate. There is to be no register of judicial interests. 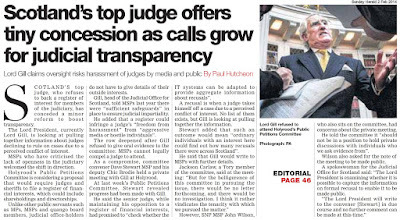 There is to be no transparency when it comes to the judiciary. Simply put, those who dispense justice cannot be, and cannot be seen seen to be immune from the laws which apply to all of us, from public expectation of transparency, or from serving the community as their position befits. There can be no excuse to the contrary. What is there to fear ? What is there to hide ? 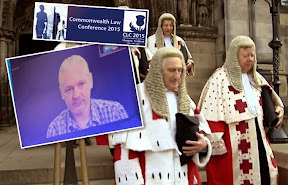 We must all abide by the same law and the same expectation of transparency, but when a country’s most senior judge lunges so out of step with accepted norms and public expectation of complete transparency in all walks of public life, Government, the courts, and the justice system and effectively dictates policy to an elected Parliament that a proposal which is such a common requirement in most other walks of public life must not apply to the judiciary, there is a clear problem which brings into question the way in which the judiciary conduct themselves and are held to account for their actions. While some have hoped for speedy action over the proposal for a register of judicial interests, the duration of the debate so far, and media publicity to the transparency plan has brought its own benefits, in terms of a multitude of new information on cases which clearly raise issues where judges have not declared interests and stepped aside, leading to potential injustice and the compromising of our courts. 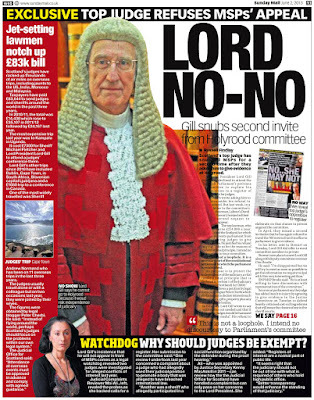 Transparency, Lord Gill, is not rocket science. 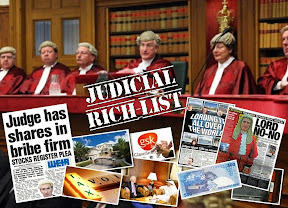 It is time for Scotland’s judiciary to declare their interests in a published register of interests, like all others in public life. Such a register will enhance public trust in a justice system which clearly needs it. Petition PE1458: Register of Interests for members of Scotland's judiciary is due to be heard again at the Scottish Parliament after the Convener and Deputy Convener of the Public Petitions Committee meet the Lord President in a private meeting to be held sometime in January 2014.